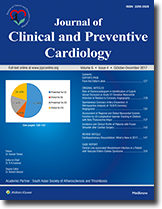 Objective: The objective of the study is to study the usefulness of electrocardiography in localizing the culprit vessel in acute ST-elevation myocardial infarction (STEMI) and to assess the diagnostic accuracy of the electrocardiogram (ECG) findings by comparing them with coronary angiographic findings. Materials and Methods: This study is prospective observational study, conducted on fifty patients in tertiary care center attached to medical college. Patients with ST-segment elevation in ECG was evaluated to identify culprit vessel and later correlated with their coronary angiography. Results: Among fifty patients in the study, 34 had anterior wall, and 16 had inferior wall myocardial infarction. ST↑ >1 mm in V4R, ST↓V3/ST↑LIII <0.5 were equally sensitive for diagnosing proximal right coronary artery occlusion. For left circumflex occlusion, ST elevation in lead III >lead II was the most sensitive and ratio of ST↓V3/ST↑LIII >1.2 was the most specific criterion. 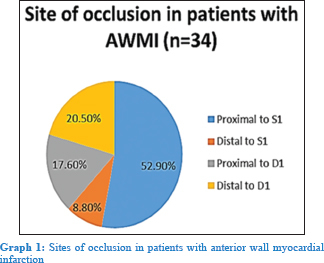 In anterior wall STEMI, 52.9% patients had occlusion proximal to first septal (S1), 17.6% had occlusion proximal to first diagonal (D1), 8.8% had occlusion distal to S1, and 20.5% had occlusion distal to D1. Q wave in aVL had maximum sensitivity for identifying occlusion proximal to D1 and Q wave in leads V4-V6 for occlusion distal to S1. Conclusion: The admission ECG in patients with STEMI is valuable not only for determining early reperfusion treatment, but also provides important information to guide clinical decision-making. Aim: Spontaneous coronary artery dissection (SCAD) is a rare cause of angina, myocardial infarction (MI), and sudden cardiac death (SCD) and may frequently manifest as acute coronary syndrome (ACS). The diagnosis of SCAD relies on angiographic visualization of a radiolucent intimal flap. Therapeutic options include medical therapy, percutaneous coronary interventions, and bypass surgery. The aim of this study is to analyze the clinical profile, inhospital outcomes, management, and follow-up of patients with angiographic SCAD. Methods: About 19,676 diagnostic coronary angiograms (CAGs) were reviewed retrospectively during a 2-year period; 64 patients had SCAD and were included in the study. Complete medical histories before and during the event as well as treatment regimens were obtained from patients' hospital files. 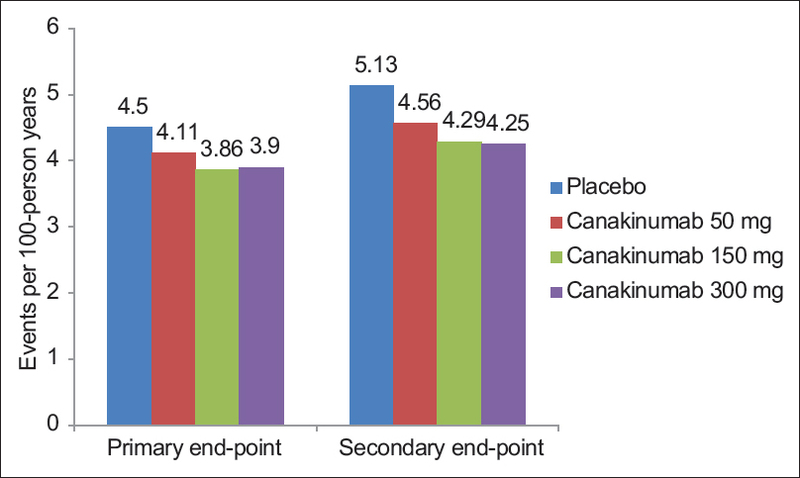 Results: A total of 64 cases of SCAD were considered for the study within an age range of 25–70 years. Fifty-eight patients presented with ACS, two patients presented with unstable angina, one patient presented with rheumatic mitral stenosis in atrial fibrillation, one patient presented with non-ST-elevation myocardial infarction, one patient with dilated cardiomyopathy with left ventricular dysfunction, and one patient with effort. Out of 64 patients, four patients died and the average hospital stay is 3–5 days. Conclusion: SCAD occurs in 0.32% of patients undergoing CAG for evaluation of coronary artery disease. Majority of SCAD occurs in men. The left coronary artery is most commonly affected. The inhospital outcomes are good. Most of the patients with SCAD have good prognosis following optimal medical therapy. Background: Thalassemias constitute a group of chronic, inherited anemias that are transfusion dependent. Cardiac disease as a result of transfusional iron overload remains as the principal cause of death in these patients even though there have been lots of improvements in iron chelation therapy during the past 25 years. For this reason, it is recommended that regular cardiac evaluation should be done for all patients with thalassemia major. Objective: The present study was conducted with the primary objective to investigate the left ventricular (LV) myocardial function using conventional echocardiographic measures as well as two-dimensional (2D) speckle tracking in patients with beta-thalassemia major who received regular transfusions and chelation therapy. Methodology: This prospective observational study was conducted in the Department of Paediatrics, Sir Jamshedji Jeejeebhoy Group of Hospitals, Mumbai, over a period of 6 months from February 2012 to July 2012. The study comprised 25 consecutive cases of beta-thalassemia major who were diagnosed on the basis of hemoglobin electrophoresis and 25 controls with normal hemoglobin electrophoresis pattern. Patients with any congenital or acquired heart disease and also patients with heart disease of infectious, metabolic, autoimmune etiology were excluded from the study. 2D, M-mode, Doppler, and longitudinal speckle tracking echocardiographic assessment was performed in all the study cases and controls. Results: The mean age of beta-thalassemia group was 7.02 ± 3.00 years whereas the control group was 5.06 ± 3.62 years. The mean hemoglobin was 5.54 ± 1.30 g/dl in beta-thalassemia patients and 10.96 ± 1.36 g/dl in controls (P < 0.001). The thalassemia patients had lower LV ejection fraction (EF) (62.20 ± 7.93% vs. 66.40 ± 1.19%, P < 0.001) and lower global longitudinal strain (GLS) (−21.73 ± 3.68% vs. −26.80 ± 1.29%, P < 0.001) as compared to the controls. The age of the child, hemoglobin level, and serum ferritin level correlated with the LVEF and GLS. Conclusions: LV systolic dysfunction is common in patients with beta-thalassemia major. This is likely to be a consequence of chronic anemia as well as transfusional iron load, compounded by poor compliance to chelation therapy and sometimes nonavailability of proper cardiac monitoring. These findings suggest that even in young children with beta-thalassemia major, who are asymptomatic, serial echocardiography is warranted to permit early recognition of LV systolic dysfunction and timely initiation of appropriate cardioprotective therapy. Background: Frozen shoulder is a condition characterized by pain and global restriction of movement with loss of external rotation. Cardiac surgery may predispose frozen shoulder as patients tend to immobilize their upper limbs after surgery. Objectives: The aim of this study is to analyze the clinical profile of patients presenting with symptoms of periarthritis shoulder and to determine the incidence of frozen shoulder among patients undergoing cardiac surgery as well as to find the factors associated with its development. Methods: It is a clinical observational study done in the Cardiology Department of Chettinad Hospital and Research Institute, Chennai, between August 2015 and May 2016, on 100 patients who underwent cardiac surgery and attended the follow-up session as an outpatient. Data were collected by face-to-face interview using a standardized questionnaire. Respondents presenting with pain and restricted movement of shoulder joint with positive limitation in lateral rotation, abduction, and medial rotation (LAM) test were considered to have frozen shoulder. Each participant was followed up for 3 months postcardiac surgery. Results: The mean age of the study participants was 53.63 ± 13.03 years, and 65% were males. Of the 100 participants, 20 (20%) developed frozen shoulder. Age (P < 0.01), diabetes mellitus (<0.01), hypertension (P < 0.001), type of surgery (P < 0.02), and regularity of physiotherapy follow-up (P < 0.01) had significant association with positive LAM test on univariate analysis. However, on multivariate logistic regression analysis, only hypertension and physiotherapy regularity were found to have a trend toward a significant independent association with the occurrence of frozen shoulder (P = 0.090 and 0.097, respectively). Conclusion: The present study shows that cardiac surgery increases the risk of developing frozen shoulder during the early postoperative period. Statistically significant correlation existed between positive LAM test and age of the patients, presence of diabetes mellitus and hypertension, type of cardiac surgery, and the regularity of physiotherapy follow-up. A timely and effective cardiopulmonary resuscitation (CPR) is crucial for saving lives of the individuals who suffer sudden cardiac arrest. Different relevant authorities have published guidelines for educating the caregivers in delivering effective CPR. The present report summarizes the recent changes in the CPR guidelines. Vascular Ehlers–Danlos Syndrome (vEDS) is a familial orphan disease inherited in autosomal dominant pattern. The prevalence of vEDS is estimated to be about 1 in 200,000. 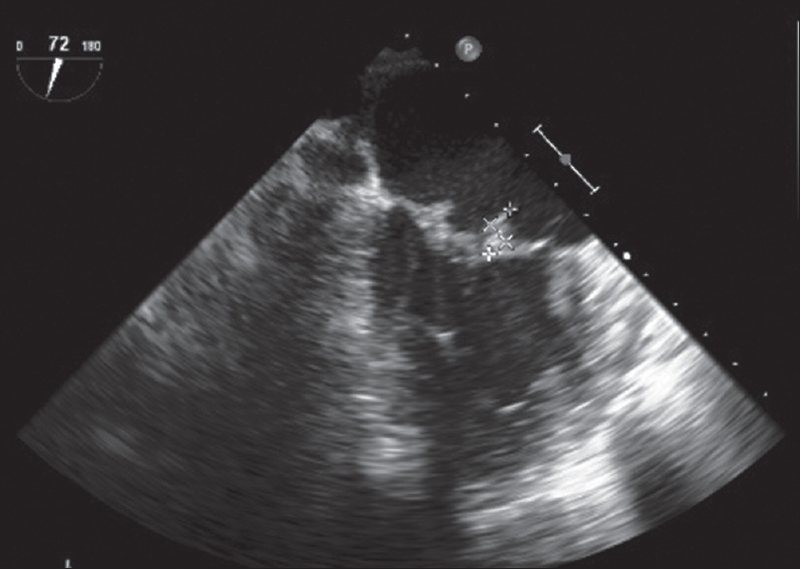 We report a case of central line-associated blood stream infection, infective endocarditis, and pulmonary septic emboli in a 21-year-old female with vEDS. Our patient was also found to have intracranial Chiari I Malformation (CIM). This case highlights the importance of screening for infective endocarditis in patients with vEDS and supports possible genetic locus homogeneity between EDS and CIM.